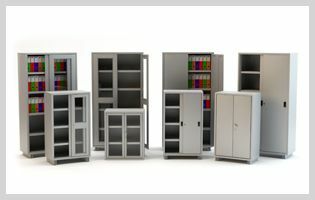 We offer different height of office cupboard for the organized system with minimum space. These office file cabinets are used for the systematic arrangement of the different sized files. Smart management of space provides proper implementation of ideal storage system. We make use of finest quality of raw material to provide safe and sound file storage systems. These filing cupboards contain doors reinforced with stiffeners, which provide high door stability. It also contains 3 way locking system with 2 keys. Robust cabinets contain load carrying capacity up to 40 Kg per shelf and drawer. Office file cabinets are available with different door options like glass doors and sliding doors. File dividers of shelves helps to manage more quantity of files. Interior fittings are ideally suitable to easy operation.